Constitutional interpretation is increasingly performed on a world stage, as judges refer to international and comparative law as a relevant - but not binding - source of law. Yet the practice is an uneven one, with some courts - and some judges - being more open to international engagement than others. This disparity unsettles the conventions of the judicial role, such as decision-making by majority when its members disagree. 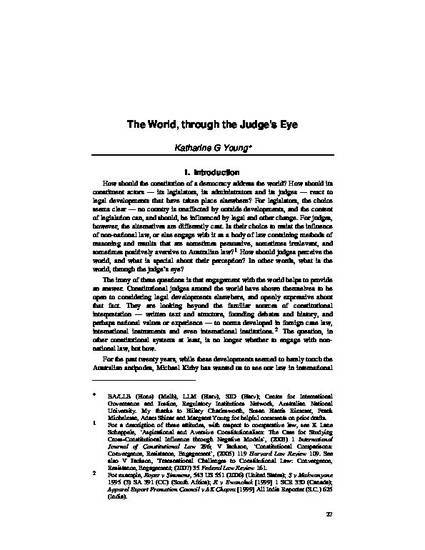 In a telling example, Justice Michael Kirby of the High Court of Australia was often alone and in dissent when citing international and comparative law, especially when interpreting the Australian Constitution. The Australian example demonstrates the way in which references to foreign law allow minority judges to introduce a new quantity - a new plurality - of informal judicial support. The article goes on to outline constitutionalism as a model of international engagement that justifies this technique. It contrasts this model with the alternative justifications of internationalism and judicial worldliness, two models that are less able to resolve questions of authority and relevance.